Three cars and two pieces of heavy equipment were destroyed. One person suffered minor injuries, Tampa firefighters said. 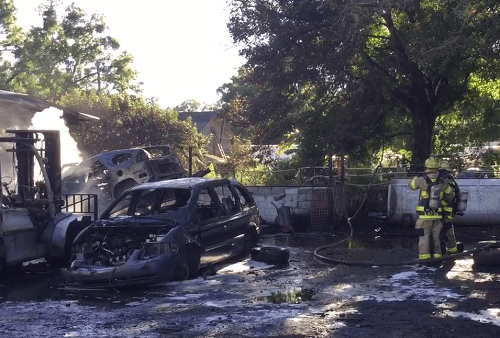 TAMPA – One person suffered minor injuries and five vehicles were destroyed Monday (April 16) in a fire at an auto salvage yard, Tampa Fire Rescue said. The person who was injured was treated at the scene but was not taken to a hospital. Tampa firefighters were called to Core Support Automotive Recycling, 6503 E Broadway about 5: 30 p.m. 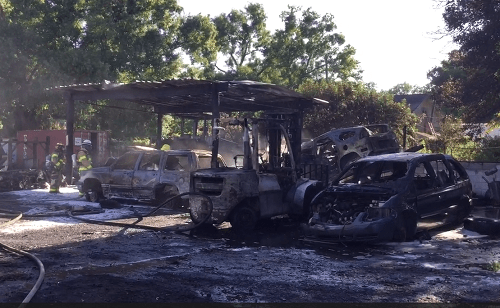 When they arrived, they saw heavy smoke coming from the rear of the salvage yard. Firefighters said they used water and foam to put out the blaze and keep it from spreading to a nearby home. The fire was out by about 5:55 p.m. According to investigators, a worker was disassembling one of the cars when fuel ignited and quickly spread to surrounding cars. Three autos and two pieces of heavy equipment were burned in the blaze. Investigators have initially ruled the fire as accidental. Photos from a video of the fire. Video courtesy of Tampa Fire Rescue.